Heat above 118 fahrenheit also destroys ALL enzymes, and most B vitamins and minerals. This is why I love my dehydrator! 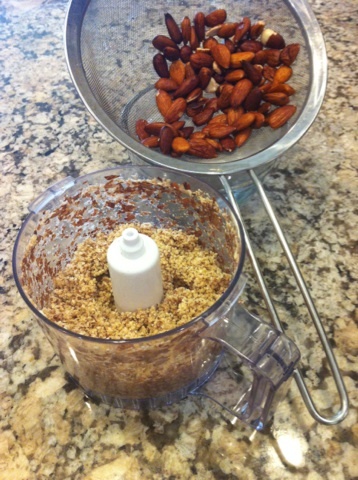 If you want to get truly serious about eating 70-80% raw, you must include dehydrating into your normal routines! The tastiest “sun dried” tomatoes I’ve had were dehydrated! Best of all they retained all their nutritional value! 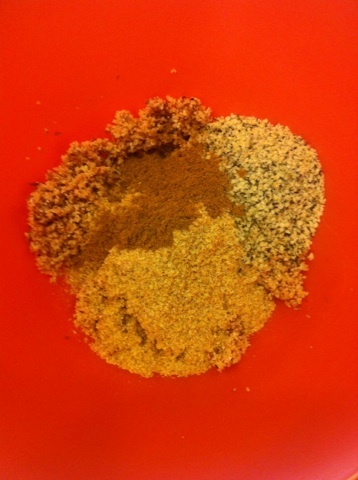 At our last food class, participants expressed the need to replace bread, crackers and chips with a healthy alternative. Sheri, like Dr. Faulkner, needs crackers “or something” to eat with her daily salad. I suggested to simply make her own especially since I knew she has a good dehydrator. The look of doubt on her face was unmistakable and one with which I could empathize. This recipe was born not just from Sheri’s desire to enjoy crackers or bread but also from her gifts to me from her garden. I cannot always immediately use all of the fresh veggies that come my way in the summer. My dehydrator saves me and the veggies. I typically marinade chunked or sliced veggies in EVOO, Himalayan salt and pepper. Often I also add fresh chopped herbs when available. The salt will begin the process of juices releasing from the veggies which creates a tasty liquid. Put your veggies on your dehydrator screens and reserve that liquid in the fridge for future crackers and breads (you can also freeze in an ice cube tray). No time? Marinade veggies in a plastic bowl or bag after dinner. Leave in fridge until next night. Home for dinner; throw the veggies on the dehydrator screen and dehydrate 3-4 hours at 115. Remove before you go to bed and store in a glass container in the fridge. Tomatoes, red peppers, mushrooms and beets are my favorites! Remember to reserve that liquid. When you are ready to make bread or crackers, simply put reserved liquid and desired veggies in a processor or blender and blend until you have a chunky liquid. Processed tomato and pepper liquid Combine all ingredients to form a soft dough. Spread dough onto a paraflex sheet on your dehydrator tray. The thinner the spread, the crispier the cracker. Be careful not to spread too thin as holes will appear as the cracker dries. This can make for a fragile cracker. Note: The dough can be refrigerated in a glass container for up to 2 days or frozen. Dehydrate on 115 for approximately 3-4 hours depending on the strength of your dehydrator. Remove tray from dehydrator. Cover with another screen and tray and then flip over. Remove top tray and screen and peel off paraflex sheet. Continue to dehydrate at 115 for another 10-12 hours (over night works well). Slide crackers onto a cutting board and use a pizza cutter to cut crackers to desired size. Store in covered glass container. Depending on the humidity, you may want to re-crisp in dehydrator for about 1/2 an hour on 125. You can also store in fridge and eat cold and less crispy. These crackers will also freeze well. Combine all ingredients to form a soft dough. 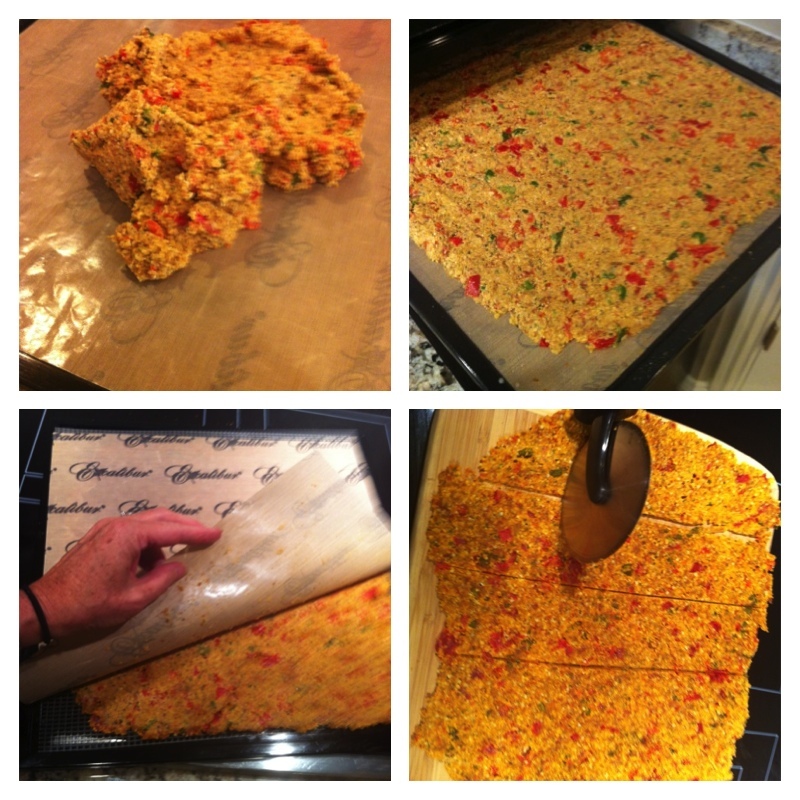 Spread dough onto a paraflex sheet on your dehydrator tray. The thinner the spread, the crispier the cracker. Be careful not to spread too thin as holes will appear as the cracker dries. This can make for a fragile cracker. Note: The dough can be refrigerated in a glass container for up to 2 days or frozen. Dehydrate on 115 for approximately 3-4 hours depending on the strength of your dehydrator. 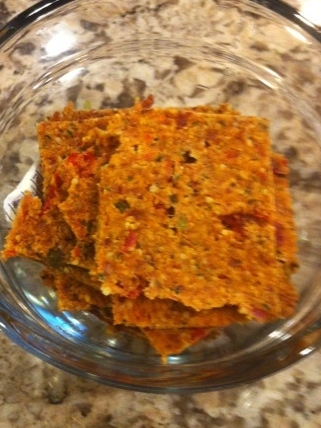 This entry was posted on May 11, 2015 by thrivecoach12 in Desserts/Snacks and tagged Dehydrator Recipe, Fairview Heights Nutrition, Healthy Cracker Alternative, Pam Faulkner Recipe, Thrive Coach 12 Recipes.